When the Short Tail promotes the Long Tail...: How come experts are so unwilling to share their knowledge? There is a lot of hype these days around the so-called Long Tail. The Long Tail idea is fairly simple. It goes roughly like this: Capitalism has endowed us with opulence (at least in developed countries). From goods to ideas, many things are available. However, we, as customers, get to see only the emerged part of the iceberg. Think of books, we see only what bookstores can carry (that is books that match their "dollar return per bookshelf square inch" benchmark over a rather short time). We don't see the rest (a bit with Amazon maybe). But the rest may be precisely what we need! So much for capitalistic opulence. Capitalism ends up synonymous of waste. However each individual knows something that may be valuable to another person. The challenge is to find how these two people can identify each other and start to share. This is where the whole shabam of social networks, tagging, blogs, wikis, folksonomy etc... comes into motion. People at their own individual level are endowed and empowered with technological tools that enable them to spread their bits of knowledge. If I know this book that nobody knows about I can spread the gospel and attract new readers to it. In a nutshell, the "humane long tail" (me) advocates the "content long tail" (the unknown book). Great! But how come the short tail (the experts, the gurus) does not do the same. After all, they know a great deal, a greater deal than I do. How come they are so unwilling to share? We know this for a fact at Cyberlibris: Indeed, we have more often than not asked faculty members who use Cyberlibris to share their favourite readings with the Cyberlibris community. End result, pretty disappointing in my own view. Hope may be back though. I just read an article from the French newspaper Le Monde. As a matter of fact this is an interview of Kenzaburô Oé, a famous Japanese author who won the 1994 Nobel Prize in literature. At the end of the interview Kenzaburô Oé explains why he has created a literature prize where the jury has only one member: Him! When asked why he says that he is unsatisfied with the current literature critic system in Japan. He wants to make sure that authentic voices are heard even if they don't sell well in bookstores. And, he concludes "A weird idea of an old man, is not it...?" No, Mr Kenzaburô Oé, this is not a silly idea. This is a bright idea that people of your calibre should buy and develop. The more initiatives like yours, the shorter the long tail! When they say fast, they mean it!!! Not convinced they ship fast at UPS? Well, this banner tells it all! One day they'll be able to ship your parcel even before you wrap it! This is supply chain management at its best indeed! Kes tu fé? Vous avez sans doute reçu ce genre de SMS. Vous avez certainement envoyé ce genre de message "peau de chagrin" vous-même. Les adolescents sont également très friands de ce genre de contractions sur MSN. Nombre d'observateurs s'interrogent aujourd'hui sur le sort de l'orthographe et de la grammaire. Beaucoup craignent que des générations entières ne sachent plus manier correctement la langue de Molière. Mais, finalement, cette inquiétude est-elle bien nouvelle? Là comme ailleurs, le recul est rafraîchissant! Dans un délicieux livre intitulé Qui étaient nos ancêtres? (J'ai Lu, 2002, ISBN 2-290-33363-8), Jean-Louis Beaucarnot nous rappelle fort à propos les temps où nos ancêtres maniaient la plume d'oie, le parchemin, le papier chiffon puis le papier bois. Les contraintes étaient multiples: encres aux recettes jalousement gardées qui sèchent néanmoins trop vite, plumes d'oie ou de corbeau chères, fragiles et difficiles à manier, papier coûteux, rugueux qui malmène la pointe de la plume... Comment nos ancêtres ont-ils fait nonobstant ces difficultés? "à plusieurs techniques d'abréviation: la contraction, qui fait écrire psse pour paroisse ou sgr pour seigneur; l'apocope, qui ne conserve que la première syllabe d'un mot, comme sep. pour sépulture, enfin les notes tironiennes..... qui sont les véritables ancêtres de nos signes de sténo..."
Avons-nous perdu la langue de Molière pour autant? The copyright landscape is far from being peaceful these days. In earlier posts on this blog I have tried to shed some light on copyright in the digital age. Here is more by Knowledge@Wharton: Will Online Publishing Flap Rewrite Copyright Law? The point the Wharton experts are making is that neither side (namely publishers and Google) gets it right. Publishers are right in that Google has indeed violated current copyright rules. However the end result of the pending court case may be a thorough revision of the copyright notion to make it more suited to the digital age and to needs of end users (us for that matter). But the train may not stop here. I like the perspective taken by Wharton School Professor Daniel Raff: "What's at stake for book publishers could be the economics underpinning the industry for the last 150 years". Indeed, the copyright debate is only the tip of the iceberg. Worse, the iceberg is melting at a fast pace: It does not resist this radical business climate change. So the question is: Shall we struggle against digital warming (which is what the forthcoming court cases are all about) or shall we get our acts together and listen to what people really want (and not what publishers or Google want)? If you are a reader of this blog, you know my answer! Thanks to Professor André Farber, Solvay Business School, Brussels for pointing out the info! I have just come across a very sad news. Peter Drucker has passed away at the age of 95. I got the news through Nova Spivack, Peter Drucker's grandson. For those who don't know Peter Drucker yet, Nova's post on his grandfather reveals the great scholar and man Peter Drucker was. Although I never had the chance to meet him in person, I remember receiving a signed copy of one of his book from his publisher. Sadly enough I lent the book to somebody who never returned it to me. Drucker proposes a definition of the CEO: "The CEO is the link between the Inside, i.e., "the organization", and the Outside -- society, the economy, technology, markets, customers, the media, public opinion." He then proceeds to explain what he means by Inside and Outside. "Inside, there are only costs. Results are only on the Outside." Somehow, and other things being equal, a very Coasian view of the world. But, the good old days (were they really?) are over. Now, with the paramount importance of human capital (high mobility), the financial revolution (easier access to financial means) and the technology revolution (allowing us to do things that were in the past only allowed/affordable to the Robbing Barons), power has shifted away from the top of the organization. The world is becoming more horizontal, less vertical and this has drastic implications on the way organizations are to be managed and even more importantly on the way they are going to reshape themselves. Sadly enough we won't hear the wise comments from Peter Drucker the sage anymore. I do hope Nova has some yet to be published material from his cherished grandfather and that he will share this with us. Pulp Emancipation: Information does not want to be free, it wants to be seen! I am currently reading the latest issue of The Economist. One article in particular has caught my eyes: Pulp friction. It's an article dealing with the recent Google, Microsoft, Yahoo!, Amazon hype on e-books. As The Economist has it: "Internet companies are racing to get books on line, but publishers are understandably wary." This is an interesting article but some clarifications are in order. First let's get back to basics. Why is it that it takes so long for books to end up on line (as a matter of fact they are already on line but The Economist and other newspapers for that matter do not seem to know it)? Indeed, music, pictures, movies are already widely available on line. All this explains why book content did not emancipate itself from its container the same way music and movies did. As a matter of fact it did try. Remember what the fellows at Forrester Research were predicting about e-books market figures. They were promissing us the moon. But who wants to read on a computer even if its a Tablet PC or a so-called e-book device? Almost nobody. Gutenberg wins by a fat margin! So much for market research. Music and movies are different. They already gained their emancipation. One can even say that more often than not they have a life of their own. Indeed, music for instance got read of its traditional container (the CD) and went on line in a quite rude manner (Napster, Kazaa etc...). And, it works. That's the way how people want to consume music. Hence a whole ecosystem has developed around music content, the most notable one these days being the iTunes and iPod ecosystem. The same is happening with movies on line and on demand. - Relevant: For sure books exist that match one's information needs. The problem is to locate them and more often than not you won't find it in bookstores, even very large ones. Bookstores carry what sells fast enough (inventories, real estate etc...). Having access to a digital library powered by a proper search engine solves the problem. Publishers are happy too: They are in a position to re-monetize a (lost) relationship and they do so at a very "granular" scale. - When: I need the info, whatever the info, now and not tomorrow. This is when I am willing to pay and where the publisher should be able to capture this willingness to pay. - Where: I need the info even though I may be in a remote place: The piano shall come to me and not the other way round! The publisher shall be able to capture my willingness to pay even if I am not in a bookstore. We have roughly 200 publishers worldwide under contract. Through Cyberlibris their books are available on line, full-text and pages can be printed. Books can be annotated and enhanced by many on line functionalities. Does it really work? Well, ask the thousands and thousands of users that enjoy Cyberlibris worldwide. Does it pay a publisher to work this way? Well, ask them! In a nutshell, do me a favor, read this.pdf (Article in French from Livres Hebdo). Again I took the liberty of singing the corporate anthem for good reasons. Cyberlibris was started as an effort to improve opportunities to share information and knowledge, in other words not only to share the "short tail" but also the "long tail" (Hint: I have been an academic in a past life and spent fifteen years of this life sharing the bits and pieces I knew with my students and colleagues). This is our daily mantra. We tend to think that it has also become the mantra of the 200 publishers that work with us! This is neither Pulp Fiction or Pulp Friction. This is Pulp Emancipation! I heard on the radio the other day that Swiss students went on strike to ask for more scholarships and less student loans. It sounds quite obvious that they would rather go for zero interest rate funding rather than for a loan with a strictly positive interest rate. Indeed, a scholarship is nothing but a fully subsidized loan. Hence what the Swiss students have been advocating is a zero cost funding topped by the right not to repay the principal of the loan. Well, I assume many of us would indeed love to be able to receive free money to fund the assets we want to invest in whatever these assets are. What strikes me is that (far too) many people seem to think that we live in an "All or Nothing" society. Either you get what you want in full (zero cost funding for that matter) or you get nothing (namely a loan with an interest rate). But wait a minute, where has their creativity gone? Human brain is admirable precisely because it has always been able to fill the void between all and nothing. Let's take the example of the student loan again. It does not have to be zero rate or fixed rate. What if it were something where the loan installments would be indexed on some earnings measurement. When earnings would go down, installments would go down too precisely when you need it badly. When earnings would go north, installments would go north too precisely when you can afford it. I know there are many contractual details to be fixed (may explain why the folks at My Rich Uncle don't offer the scheme anymore (?)). But the spirit is there: Use your brain to fill the void. Last week-end, we went visiting antic shops and I was able to buy a vintage textbook dated 1900. 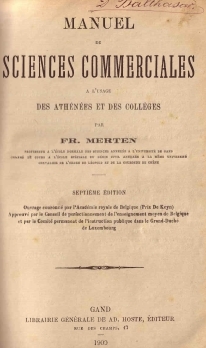 The textbook is entitled "Textbook of Commercial Sciences" and has been written by Professor Merten of the University of Ghent. Very interesting book (we should have some of these wonderful vintage textbooks in Cyberlibris) where you can feel the author's passion for pedagogy. Two things in particular have caught my eyes. The first one is related to the way the reader can authenticate whether he is reading a true copy or a faked one. Simple, each true copy has to carry the author's signature. The absence of the signature indicated that the copy is fake. It begs the question however of how you know the authors' true signature in the first place and how you can be sure it has not been counterfeited. The second thing has to do with copyright and copyright enforcement. We all know the traditional formula. It usually says "All Rights Reserved". "All rights are reserved in accordance with the law. I am willing to sue anyone who would, in violation of my copyright, reproduce any theory or proof from this book, either from past editions or from the current one." The Publisher. One cannot be clearer! Somehow I find it more "romantic" than the rather dry "All Rights Reserved". What strikes me is that here again we are stuck in an "all or nothing" situation. Either the book is copyrighted (all) or the book is public domain (nothing: No Rights Reserved). This is sad! What about having something that would say "Some Rights Reserved" I know that Lawrence Lessig and the folks at Creative Commons are fighting big time for this. The simple fact that they have to fight for it is again a strong evidence of the pervasiveness of the "All or Nothing" society. By the way the book by the way is an interesting creature as it blends in one entity the hardware and the software, the container and the content. Gutenberg was smart indeed! But this obvious fact has odd consequences that we know quite well at Cyberlibris. Publishers often say that their business is to sell books. Not true! Their business is to sell content. This begs then the question of what is the best "container" to sell the said content. Sometimes Gutenberg is the winning option. Sometimes not. Again it is not all (Gutenberg) or nothing. Digital for that matter may win and that's how we make our living at Cyberlibris (not any kind of digital though: Digital without a clean and proper business model is doomed to failure). The "All or Nothing" society is a real plague and the last thing we should do is surrender to it, an insult to our brain indeed. Next time you see or feel "All" or its mate "Nothing", watch and listen carefully there might be room for a new business. Your business!